They will play a five-date tour as the four main figures who scored a string of hits in the early 1970s get back together. All four were in the group when they adopted their name in 1967, and featured on their breakthrough top 10 hit Pictures Of Matchstick Men. The band members - Francis Rossi, Rick Parfitt, Alan Lancaster and John Coghlan - will play live together for the first time in three decades. Frontmen Rossi and Parfitt have carried on under the name but the others parted company from the line-up - known as the Frantic Four - in the 1980s. This year also marks 50 years since Rossi and Lancaster first formed a group. The band became known for hits such as Rocking All Over The World, Down Down and Caroline. 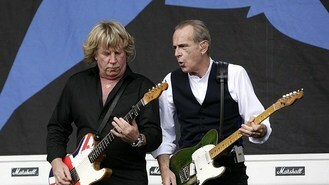 Quo manager Simon Porter said: "People have wanted this announcement to be made for years, and here it is. "This is a real moment in the chequered history of Status Quo and it comes after almost 30 years of acrimony, and 10 years of lawsuits and court battles. "Just two years ago the thought of the Frantic Four performing again was unthinkable. Now, 50 years on from when Francis and Alan first performed together as schoolboys, it is fitting that everything has come full circle for these unique one-off shows." Tickets for the shows, taking place in Glasgow, Manchester, Wolverhampton and London during March, will go on sale on November 16.